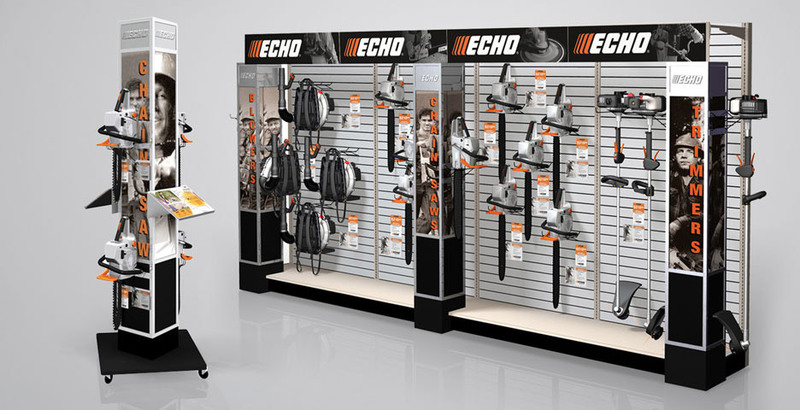 ECHO Outdoor Power Equipment charged us with creating a national merchandising program that would enhance awareness of the ECHO brand by establishing a consistent retail presence throughout the U.S.
We conducted a field audit by collecting dealer opinions and investigating display systems for comparable equipment in target outlets. It was discovered that dealers needed a system to work with their limited floor space and existing slatwall or gondola shelving displays, which supported expandability and retrofitting. Imagine designed a unique modular system to work within these parameters and all dealers’ individual store designs.